Senator Hillary Clinton has threatened “massive retaliation” against the Islamic Republic of Iran were it to use nuclear weapons against the State of Israel. She has engaged in on-the-run extended deterrence by threatening the destruction of Iran were it to use weapons of mass destruction on third countries in the region as well. ForÂ the record, Iran is a non-nuclear weapons state and has issued a Fatwa against pursuing a nuclear weapons capacity. Even If insincere, it is many years away from weaponising and deploying atomic systems in its arsenal. There is no urgency or hint of such a capacity on the part of Iran. What she is advocating is the extermination of tens of millions of Iranians and a possible second-strike retaliation against the United States were it to engage in a preemptive nuclear war against Iran. The senator appears unaware that Israel is a major nuclear power and possesses between 150 and 200 nuclear warheadsÂ that can be deployed on both United States built fighter aircraft or launched by missiles.Â I have never, even during the days of the Cold War, witnessed such reckless if not evil rhetoric in which innocent civilians would be slaughtered by the millions in such an indiscriminate manner. Israel hardly requires an extended deterrence from the United States: the nuclear nation which worked with South Africa during its apartheid regime to acquire and refine its nuclear capacity, does not require American nuclear protection. Iran would hardly benefit from a nuclear attack on a nuclear power in the region. The only group that needs our protection are the Palestinians who are the victims of one of the greatest violations of human rights since the end of World War II. For Senator Clinton to be even contemplating a nuclear attack on a country as part of a political campaign strategy is unseemly and I believe an evil and despicable lack of ethics and morality. Her initial description of her nuclear plans of deterrence as “massive retaliation” wasÂ utteredÂ during the disturbing high-tech lynching of the Philadelphia debate. Â Massive Retaliation was introduced by Secretary of State John Foster Dulles in a speech before the Council on Foreign Relations in New York in 1954. At the time, the United States believed it lacked the conventional might to restrain a possible Soviet attack on Western Europe and so Secretary Dulles suggested that the U.S. might use nuclear weapons to deterÂ both a CONVENTIONAL as well as a Soviet nuclear first-strike assault. The policy of massive retaliation ratcheted up the scenarios in which these monstrous atomic and thermonuclear weapons would be used. The policy even for the United States was quickly discredited as a doomsday strategy in which nuclear warfare would be triggered by even a limited Soviet conventional surge across the Fulda Gap–the symbolic division between the boundaries between the former West and East Germany that was closest to the Rhine River. Of course its successor, Flexible Response, was equally flawedÂ even if never fully articulated by either Secretary of Defence Robert S. McNamara and his successors at DoD. The New York senator has cynically and ignorantly taken a Cold War doctrine and to put it mildly given it a horrific new level of application. 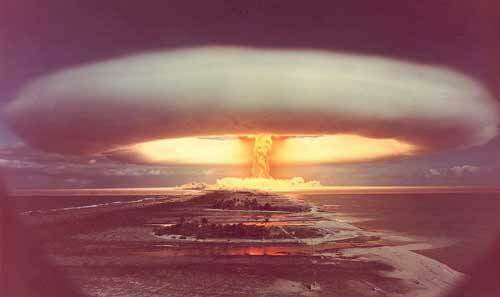 If a nuclear state is attacked by another nuclear state, the U.S. will attack the attacker with nuclear weapons. I have never heard of a nuclear umbrella being extended to a major nuclear power such as the State of Israel. I also construe Mrs. Clinton’s remarks to be racist, antithetical to the need for diplomacy and reconciliation and a political ploy to appear to be out Thatchering, Margaret Thatcher, the former blustering British Prime Minister. I say shame on Senator Clinton and under no circumstances, do I see any qualities in this individual that would be worthy of an American president. She should suspend her candidacy and be condemned by the Democratic Party as unprofessional, violent-prone and a threat to global justice and the international community. This entry was posted in External Affairs, Politics/Music/Culture. Bookmark the permalink.